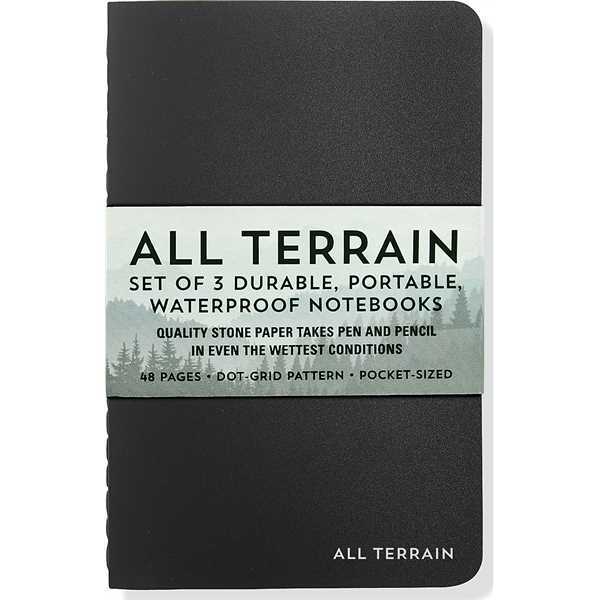 All Terrain: The Waterproof Notebook. Set of 3. Each notebook measures 3-1/2" wide x 5-1/2" high (9 cm wide x 14 cm high). 48 pages each. NOTE: Works best with pencil. Each notebook is printed with a light dot-grid pattern. Waterproof stone paper withstands rain and other harsh conditions. Weather-resistant covers. Sewn binding for added durability. Set comes shrink-wrapped. Size: 3 1/2 " x 5 1/2 "
Price Includes:4 color custom designed cover on 3,000 pieces and above.